We unexpectedly tried out a new (to us) brunch place last weekend and loved it. 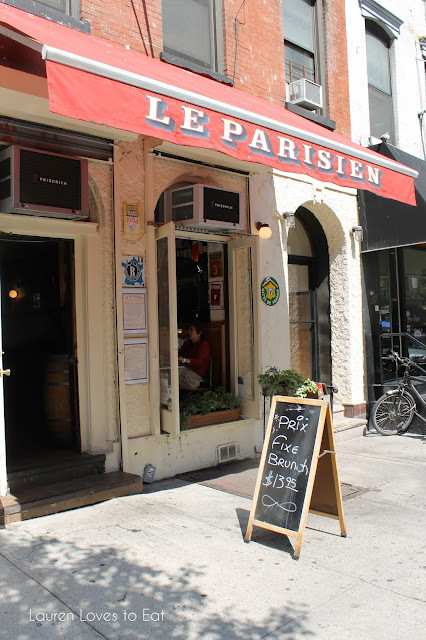 Le Parisien offers a prix fixe brunch deal of $13.95 for an entree and drink (mimosa/sangria/coffee/orange juice). The shop is simple but very cutely decorated with French posters and artwork hanging on almost every wall. For the attentive service, great food and reasonable prices, this place is seriously a steal. I've said over and over again how much I love Balthazar, and I feel like Le Parisien offers an opposite but just as appealing experience-- no crazy wait times and hard-to-get reservations, it's smaller and friendlier, and again, prices are unbeatable. We were actually on our way to Cask Bar & Kitchen (right next door to Le Parisien), but when we saw the brunch deal and the menu, I wanted to try something new instead. The restaurant was quite full, but we were lucky to encounter no wait at all. 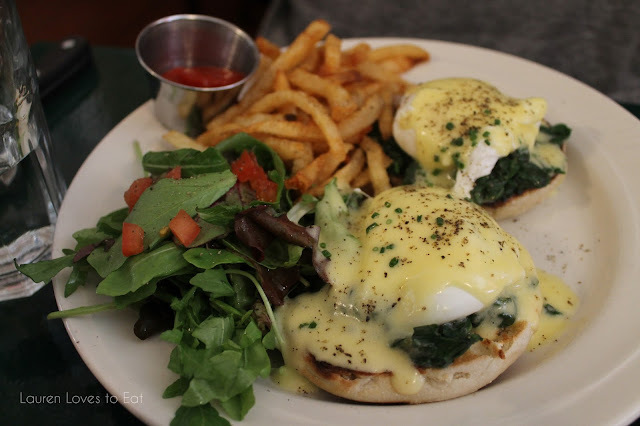 Eggs Florentine: spinach, hollandaise sauce on English muffins. 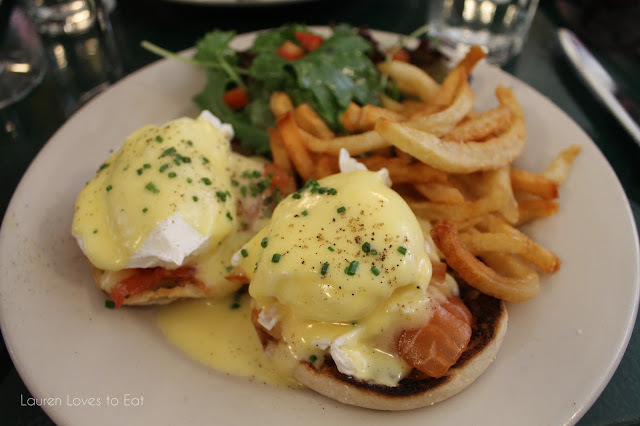 Poached Eggs with hollandaise sauce and salmon gravlax on English muffins. Basically a salmon benedict, this was delicious! The smoked salmon was fresh and the hollandaise sauce rich and buttery. I was so happy to learn that each entree comes with both fries and mixed greens (it's always a tough decision between healthy or tasty!). 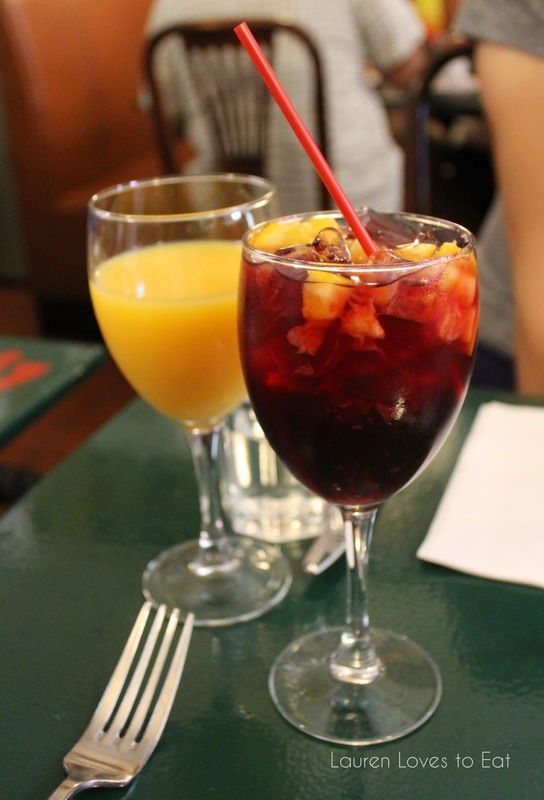 The sangria was perfect-- not too sweet, and a great ratio of fruit to wine. This looks so good... we should meet up for brunch one day in the city. I love places like this. So nice seeing you the other day Lauren, you're so funny! Hi Nisha, brunch is my favorite!! Would definitely be down for that :) Great catching up with you too!